Serco are famously the biggest company you’ve never heard of – the outsourcing giant who run everything from HMP Kilmarnock to our nuclear deterrent (well, one-third of it), the Orkney and Shetland ferries, the entire logistical arm of the Royal Navy, the Caledonian Sleeper, and – the real jewel in the crown of their Scottish operations – Edinburgh’s new on-street bike hire scheme (coming this autumn!!!). Since the collapse of that other profiteering outsourcer, Carillion, last year, Serco have even taken over service contracts at six Scottish hospitals, including the QEUH in Glasgow, on top of their existing contract to run the new hospital in Dumfries for 25 years (Who said the Scottish NHS isn’t being privatised?). So few have heard of Serco, seemingly, until they suddenly find their job TUPE’d over to them, as tends to be the case with private companies bidding for public tenders. Or, as it now turns out, until they find they are being evicted by them. At the weekend it emerged that Serco will this week be changing the locks on Glasgow accommodation housing more than 300 “failed” asylum seekers who have been told they can no longer stay in the UK. Housing for asylum seekers in Glasgow – first ‘dispersed’ to the city in 2000 to be shoved into decaying multi-storey flats – has always been grim. But the arrival of a Tory government meant things could only get grimmer. In 2012 it was fully privatised, with Serco winning contracts to run asylum housing for two regions: Scotland & Northern Ireland and North West England. The contracts end in 2019 and a £3-4bn tender is currently out for bidding, with Serco the “overwhelming favourite” to retain the £500m Scotland & NI tranche. A Glasgow City Council bid was rejected almost immediately by the Home Office. “Serco has significant experience of looking after vulnerable asylum seekers and providing decent and safe housing for the 16,000 people on our COMPASS contracts in Scotland and Northern Ireland, and in the North West of England,” the company helpfully explained last December. “Safe and decent housing”, that is, until they decide to throw them on the street – as is now happening. 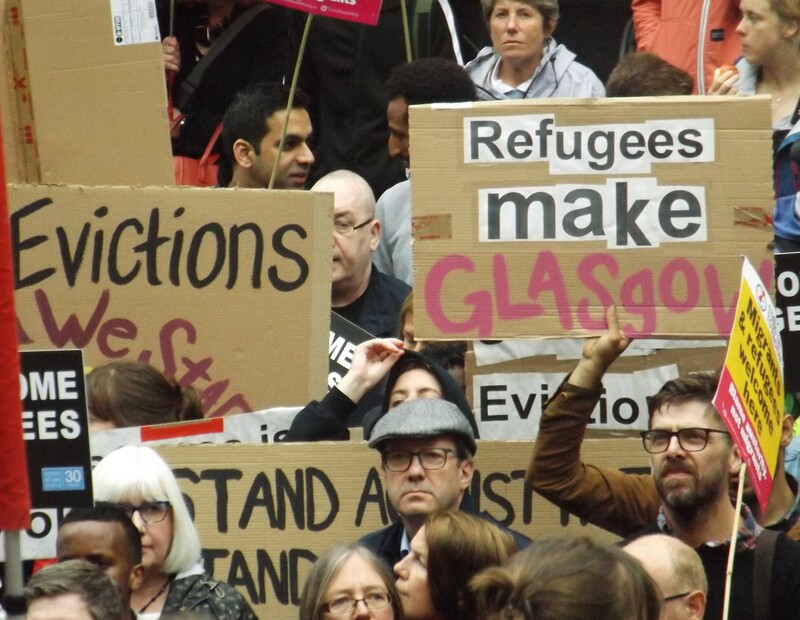 The move has provoked outrage and united condemnation from Glasgow City Council, MPs, housing associations (many of whom lease flats to Serco) and refugee charities. Once evicted, asylum seekers are left destitute, with no recourse to public funds (like the tiny weekly allowance they get while ‘in the system’) or social housing. It was this which brought hundreds on to Buchanan Street earlier tonight, at incredibly short notice, demanding that the evictions are halted, with speeches from local campaigners and politicians. Serco’s chief executive is Rupert Soames, the grandson of Churchill and brother of Tory MP Nicholas., He earned £2.2m in 2016. Remarkably, Soames has claimed that the company makes a loss on each of the 14,000 asylum seekers they are responsibile for housing, which includes 3,800 in Glasgow. In evidence to Parliament, Soames claimed while Serco receives £300 per month per asylum seeker while their claims are being processed, their costs average £450. Evidence from the Scottish Refugee Council, meanwhile, stated that “shared rooms for 3 to 4 people are the norm and not the exception in hotels and hostels”. The organisation also questioned whether any savings are really made from privatising housing provision, arguing that it simply shifts the burden of support on to other public agencies and charities, as we’re now seeing. If Serco really are making such a massive loss on packing in asylum seekers four to a room in cheap hostels, it raises the question of why they’re so keen to bid for the next round of er… £4bn contracts. But then the company has openly admitted they “under-bid” on the existing contract, so desperate were they to secure it – Rupert Soames said as much to the House of Commons Home Affairs Committee. It’s not a vastly different situation to the one which has seen the East Coast rail franchise repeatedly re-nationalised, after the private companies running it found they couldn’t turn their revenue and profit projections into reality. Something has to give in those circumstances, and either costs are cut, or as a last resort, it gets handed back to the public sector. Serco have already taken the Glasgow contract back “in house” from their sub-contractor, following complaints in 2016. When Serco first won the Northern Isles ferry contract, they immediately tried to reduce operating costs by cutting 36 jobs, reducing sailings and hiking fares. With the asylum contract, it’s hundreds of vulnerable people that are instead set to be thrown out on to the street as Serco attempt to maintain their profit margin. This is Serco’s only real area of expertise. When they take over a niche sector, they simply buy in the skills or transfer them over from the previous operator. When they’re in a field like housing asylum seekers, they don’t even need to bother with that. They can simply throw people out on to the street. It’s a strange way to run any public service, and an even stranger way to run one responsible for the care of vulnerable and often traumatised refugees. As for the more immediate issue of Serco’s actions leading to hundreds of people being made homeless, does anyone know of any kind of facility with dozens of beds that arrives in Glasgow every evening??! Any ideas??? Did the Daily Record force a Syrian refugee family to flee their Scottish home?